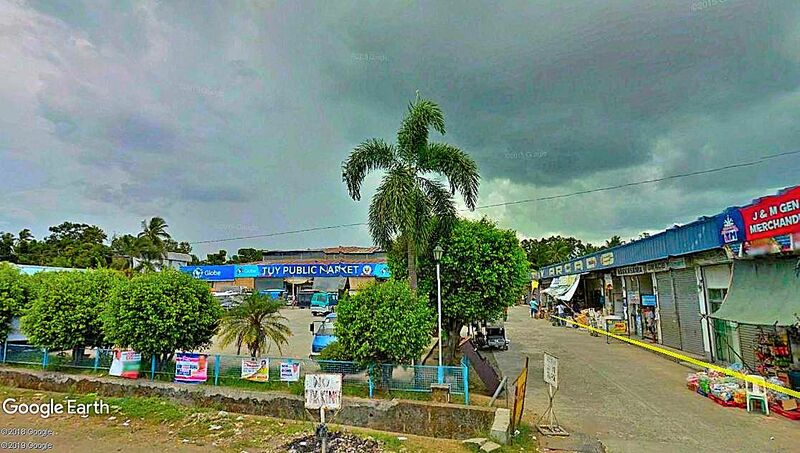 Tuy is a small town in western Batangas with a land area of 94.65 square square kilometers and a population of 43,743 as per the 2015 Philippine Census1. 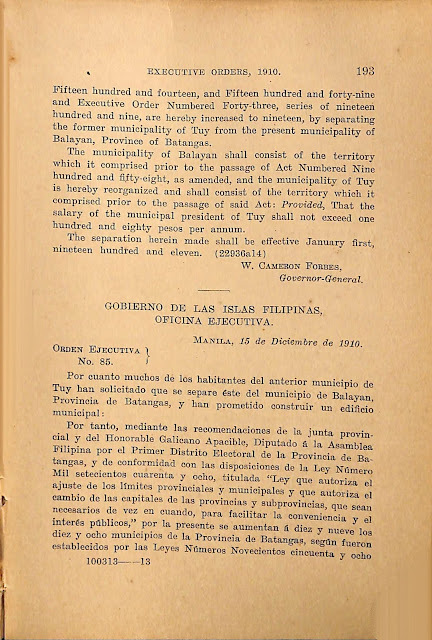 According to the web site of the government of Tuy2, the town used to be part of Balayan but was made a separate municipality on 12 August 1866. 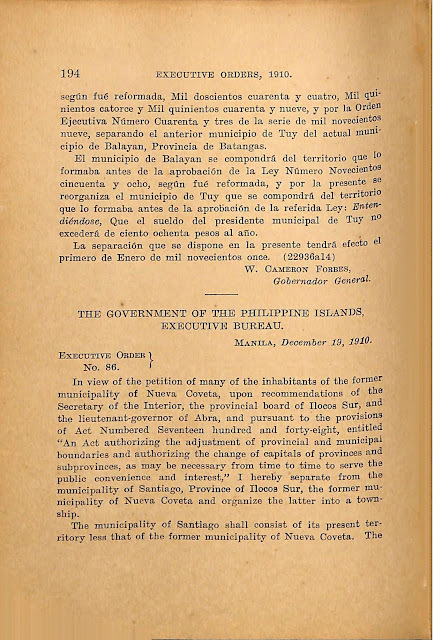 The town was returned to Balayan for governance early during the American colonial era but was again granted township status by Executive Order No. 85 signed by the Governor-General W. Cameron Forbes. The contents of the executive order are provided below, along with scans of the same in both the English and Spanish languages. 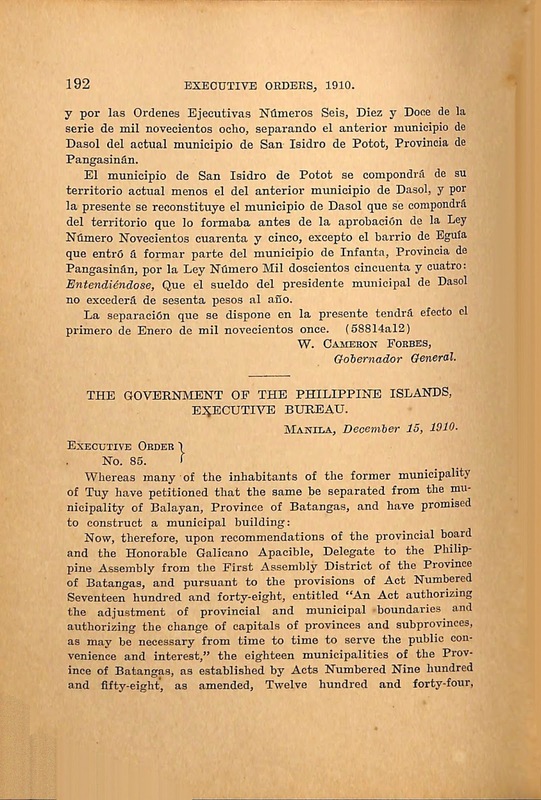 Now, therefore, upon recommendations of the provincial board and the Honorable Galicano Apaciblc, Delegate to the Philippine Assembly from the First Assembly District of the Province of Batangas, and pursuant to the provisions of Act Numbered Seventeen hundred and forty-eight, entitled “An Act authorizing the adjustment of provincial and municipal boundaries and authorizing the change of capitals of provinces and sub-provinces, as may be necessary from time to time to serve the public convenience and interest,” the eighteen municipalities of the Province of Batangas, as established by Acts Numbered Nine hundred and ﬁfty-eight; as amended, Twelve hundred and forty-four, Fifteen hundred and fourteen, and Fifteen hundred and forty-nine and Executive Order Numbered Forty-three, series of nineteen hundred and nine, are hereby increased to nineteen, by separating the former municipality of Tuy from the present municipality of Balayan, Province of Batangas. 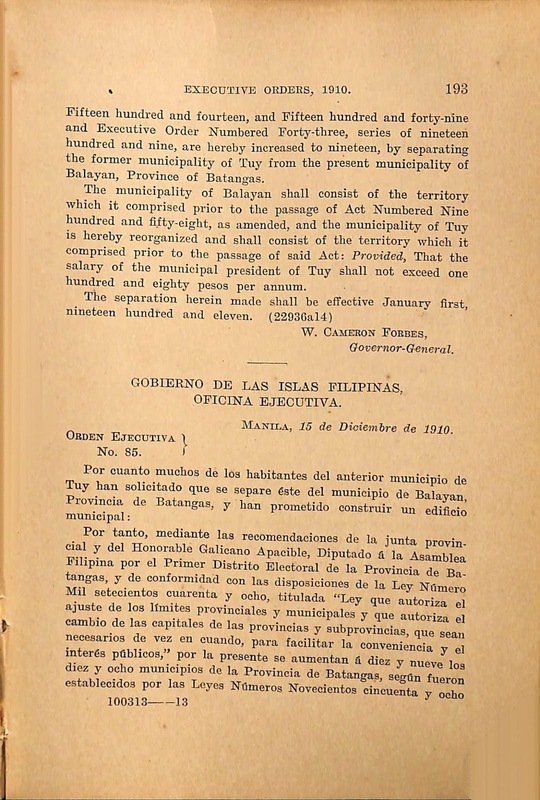 The municipality of Balayan shall consist of the territory which it comprised prior to the passage of Act Numbered Nine hundred and ﬁfty-eight, as amended, and the municipality of Tuy is hereby reorganized and shall consist of the territory which it comprised prior to the passage of said Act: Provided, That the salary of the municipal president of Tuy shall not exceed One hundred and eighty pesos per annum. Executive Order No. 85 s. 1910 English version. Executive Order No. 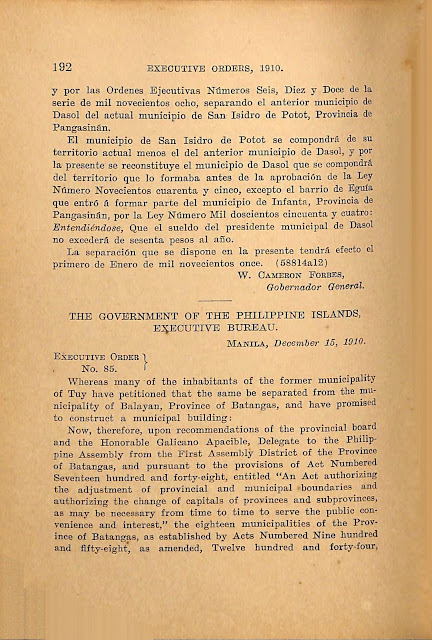 85 s. 1919 English version continued; Spanish version. Executive Order No. 85 s. 1910 Spanish version, continued. 2 “Historical Background of Tuy, Batangas,” online at the Tuy Government Web Site. 3 “Executive Orders Nos 1-96,” online at the Internet Archive.